Learn how to create interactive worksheets by viewing this pre-recorded webinar. Take a photo of the printed worksheet or open an image or PDF file in the app. Then customize the digital worksheet to your student’s needs. Create text fields, word banks, and drag-and-drop text or image answers. Supportive auditory options can also be added to text or image answer choices. The app uses optical character recognition (OCR) and text-to-speech to read selected text aloud. Additional auditory instruction or student prompting can be added. Students answer questions by selecting from word banks, typing on a keyboard, tapping to select from multiple choices, dictating with Siri, circling or drawing connecting lines with a draw tool, or dragging answer choices. 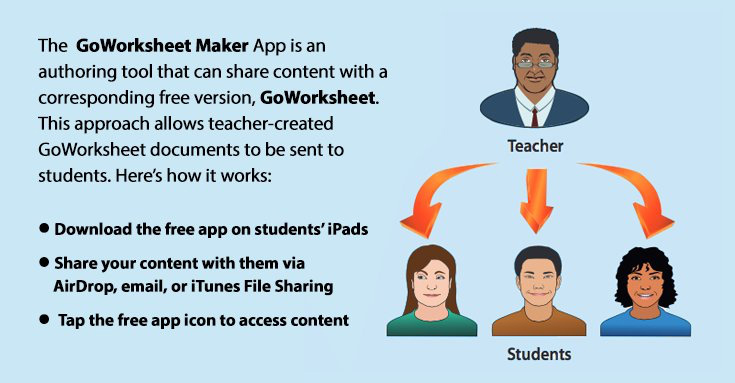 GoWorksheets can be shared through AirDrop, email, print, any cloud storage set up on the iPad (Google Drive or Dropbox), or saved to Photos. Once a worksheet is on the iPad, all your students can work with the same classroom material. Requires iOS 9.1 or later. GoWorksheet Maker has full editing ability for teachers to use, while GoWorksheet is a free app that students use to work on digital worksheets. Purchase Plan. Or buy directly from Attainment Company via purchase order.